Transport in Whaingaroa looks very car dominated, with only 96 of 1,185 Raglan travel to work journeys on census day 2013 made by bike, bus, or walking. In Te Uku it was 15 out of 969. Raglan differs from most of the region in being a destination rather than a place on the way to somewhere else. Therefore it doesn’t figure highly in regional plans. As a tourism hub we endure high levels of frustration due to capacity, especially in the summer peak. 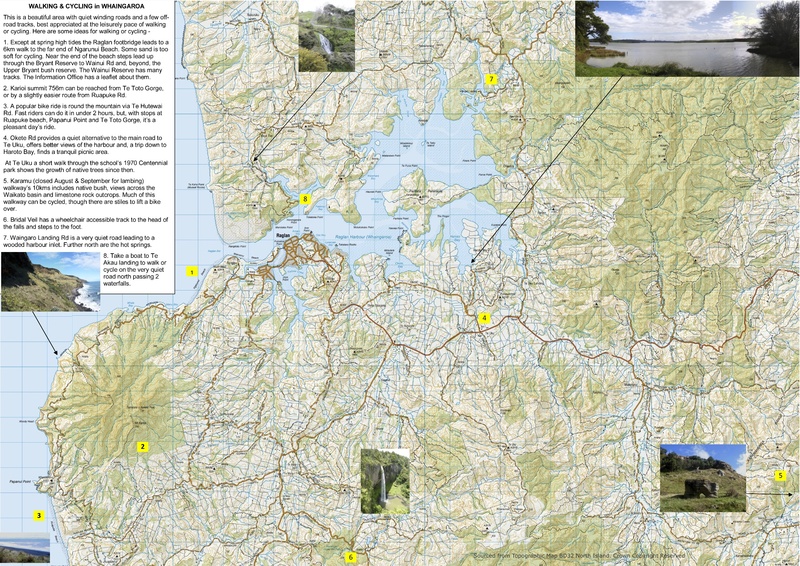 The Infrastructure and Transport chapters of the 2001 Raglan Naturally plan didn’t look at climate change, but had proposals to improve transport, including free buses to the beaches and more to Hamilton, ferries, bike paths, a village square, a CBD mall with service lanes, traffic calming on SH23 from Greenslade Rd and upgrading Wainui Rd footpath. Public transport is poorly developed in the Waikato Region, with only 0.9% of trips made by bus in 2013/14. This compares with 2.3% nationally, which itself is amongst the lowest in the world; OECD public transport use averages 18.9%. Waikato, like all other regions, with the exception of Auckland and Wellington, has seen falls in use of public transport since 2012. Walking and cycling have also been declining, down to 19% of trips in main urban areas, with Hamilton lowest at 14%. That leaves the car as the main form of transport, with increasing problems of congestion, parking, safety, resource use, cost and pollution. This country had 3,631,058 cars in 2016; slightly over one per adult (in 2013 there were 3,376,670 over 15s). One of the exceptions is Waiheke Island, where only 1,515 out of 2,562 drove to work and 351 went by bus, bike, or on foot. TomTom reported Hamilton congestion up by 5% in 2016 and parking is often hard to find in Raglan and Hamilton, without a lengthy walk. Bike Auckland produced these pictures to illustrate the efficiency of buses and bikes in using space in urban areas. For parking buses take up the space of about 2 cars, but they’re usually on the move and not taking up parking space for as long as cars. Of deaths and injuries in 2015, 57 out of 12,589 (0.45%) were to bus drivers, or passengers. So buses are about 5 times as safe as cars. RN 2001 mentioned a possible global rise in sea levels. Since 2001 it has become more widely accepted that climate change is a problem, though council says it, “has not been as proactive in addressing climate change mitigation as some other councils”. The Government’s 2018 Transport Policy Statement says, “Transport has an important role to play in New Zealand’s efforts to reduce greenhouse gas emissions.” It also anticipates further measures once the Climate Change Commission is established. Road transport adds 16% to this country’s greenhouse gas emissions and road vehicles use 49% of fossil fuel energy burnt in this country (cars 32%, trucks 16%, buses 1%). Over half the $9bn of oil imported each year goes into cars. Aaron Mooar, Angela Williams, Bob MacLeod, Charlie Young, Deb King, Dirk De Ruysscher, Edith Thorley Symes, Jennie Hayman, Linda Silvester, Lisa Thomson, Malibu Hamilton, Michael Becker, Mike Loten, Niall Darwin, Phil McCabe, Justine Quarrell, Richard Law, Suz Hall, Sheryl Hart, Tim Duff. Raglan Community House, West Coast Health, Whaingaroa Environment Centre. A more mobile and growing population has seen average daily traffic numbers, as measured on the main road near Wright’s Rd, increase from 2,850 in 2000 to 4,758 in 2016. The numbers on the Raglan-Hamilton buses have risen even faster, accounting for overcrowding (22 times in 2016) and the need to run an 85-seat double decker on some journeys. Passengers have increased from 24,392 a year in 2003 to 63,571 in 2017. In that time the main road has been widened in a couple of places to provide for overtaking, an extra midday bus has been added, weekend buses restored and the peak services are now run by 2 buses, plus a smaller bus providing relief between Whatawhata and Hamilton. Parking has been increased at the wharf, at the corner of Wallis/Bow St and on Bankart St, Wallis St and James St (57 spaces in 2014 as part of a $448,939 upgrade). It has not reduced calls for more parking. The boat ramp asset assessment suggested a user pay system for non ratepayers. CBD parking ranked high in the list of Raglan priorities in 2014. However, in the 1999 RN survey, 53% supported car parks funded by users, but only 26% supported funding from rates. For some time the area behind the corrugated iron in Wi Neera St was advertised for parking at $10 a week, but very few took it up. That suggests users are not willing to pay for additional parking and, if a large majority still believe in user-pays, extra on-road parking is not needed. Length of stay has also been controversial; the longer the time permitted, the fewer can use spaces at peak times. Some 1 hour limits on Bow St are to be raised to 2 hour. Raglan Club (for a fee) & Rugby Club have large car parks available, but, as the Google map shows, often have many vacant spaces. IRD allow 76c/km, so that cost of the 90km round trip to Hamilton by car is around $70. The adult bus fare is $8.50 cash, or $6.20 with a BUSIT card. Child fares are $5, or S4.20 and SuperGold cards allow free travel from 9am to 3pm, weekdays, and all day, weekends and public holidays. So, only with 4 in a car and no bus cards, does the bus become more expensive. With bus cards, 4 in a car could save about $15 per round trip and even 5 would find the bus cheaper. Raglan bus has farebox recovery of 47.15%, higher than Hamilton’s 34.06%, or the region’s 35.74%. In February 2017 council reported, “A net decrease in bus contract payments of $55,000 is forecast”, presumably the savings on the bus contract which started in April 2017. Many local politicians have regarded buses only as a social service. Just as they object to pensioner housing subsidies, so they have objected to bus subsidies and often kept them to a minimum; over 5% of Waikato District’s population don’t own cars, yet much less of council’s transport budget goes to buses and footpaths. NZTA is currently spending $10m, between Waitetuna and Raglan, to make SH23 safer, following 2 deaths and 23 serious injuries on that 21km over the last decade. There’s still another 19km of road to be done, where 3 have died and 41 been injured. 47% of SH23 crashes involved alcohol, yet there is no evening bus. The 2001 RN plan had only a single word about the airfield in its Recreation chapter. Since then more people have been visiting and living in the area, so that more aircraft are landing and more people walking across the airfield, to the extent that the Civil Aviation Authority suggested fencing it off and diverting walkers around it. The airfield was taken in 1941 as an emergency landing ground for aircraft damaged during the war. The story of the return of the southern section is in many places, including this Waikato Times article and this 1978 article. The Community Board has asked whether mowing and other maintenance charges are met by receipts from landing fees, but never had an answer. It is a large, flat, well-maintained, public space, only used by a few aircraft. It supports a few jobs for aerial sprayers, but they also use several other airstrips in the area, which are equipped with suitable storage bunkers. Alternative use for sports fields, tree planting and other community events has been suggested. Several crashes have occurred, including one on Boxing Day 2014, when a plane went into the harbour. Suggestions have been made that an alternative use as a public space would allow for the oversubscribed soccer fields to expand, for other community events and for tree planting to reduce coastal erosion. There are Waitangi Tribunal claims for the airfield, with rulings at a draft stage. How does this challenge impact on Transport? How does Transport impact this challenge? What is the opportunity for us inTransport in relation to this challenge? Environment/health/ economic Safe, usable cycling network, evidenced by at least 10% of journeys under 5km made by bike Council and/or cycle group Bike lanes / bike paths created. Health / economic To get more people exercising and provide low carbon tourist activities Council and/or walk and cycle groups Implement Council’s Walking, Cycling and Bridle Trails Strategy as shown on maps in the draft strategy. Health To get children exercising and using bikes for travel Schools Ensure local schools are among the 15 a year receiving bikes – as page 64 of Waikato Regional Bikes in Schools Plan. health To get children exercising and using bikes for travel and reduce congestion around schools Schools An NZTA guide explains walking school buses, how to set them up and keep them going. Bicycles can be used in a similar way. 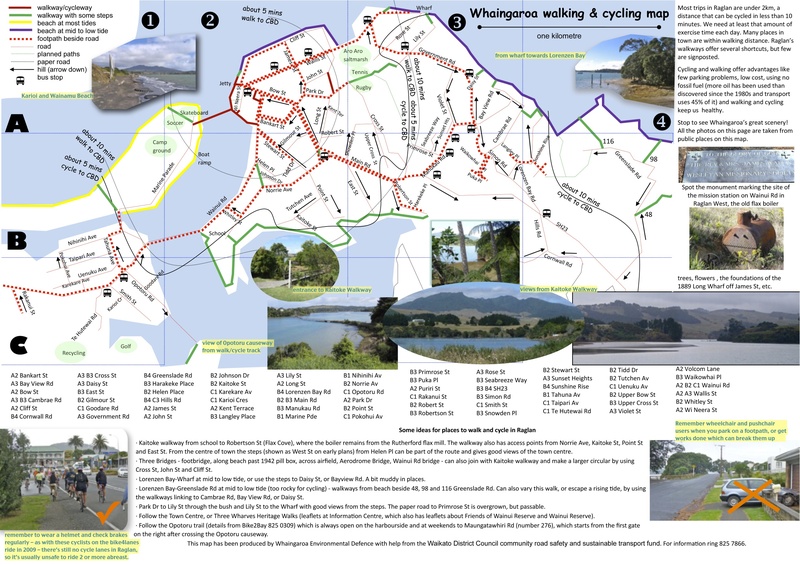 Economic/health To get more people exercising and provide low carbon tourist activities Raglan Ramblers, Raglan Mountain Bike Club Walking and cycling can be popularised by social group walks. Raglan Ramblers have been rambling weekly since 1990, but almost always on Wednesdays. Walks and rides at weekends and summer evenings could be organised. 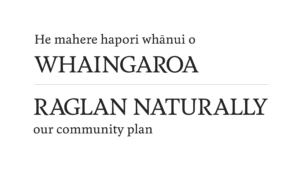 Economic/health To get more people exercising and provide low carbon tourist activities Raglan Ramblers, Federated Farmers Create attractive new walks around Whaingaroa similar to those on Banks Peninsula, where a cooperative venture has attracted visitors and provided income to farmers. Environment/economic To provide low carbon tourist activities and transport alternatives Boat operators Ferry to Te Akau wharf and Rangitahi and sightseeing and transport trips around the harbour to Waingaro, Okete Falls, etc and along the coast to Karewa Is, Kawhia, Aotea, Port Waikato, etc. Environment/health To make best use of an area currently used for transport, taking account of noise, fumes, employment and access Community Board led consultation Determine best use for airfield. 2. What changes would be needed to get you using your car less, or are you one of the 111 not using a car? 3. A priority in Raglan Naturally 2001 was “A central business district mall –– in whole or part.” Is a car free mall still a good idea and, if so, where? Here’s a photo of Bow St as a pedestrian mall in 1911. 4. Where should the first cycleway be? 5. What should decide priorities for new footpaths?